Four mystery dramas based on the novels by Georges Simenon and starring Rowan Atkinson as the eponymous French detective. 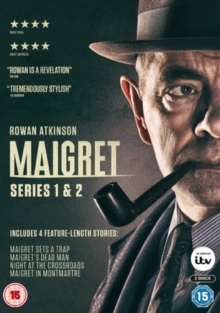 In 'Maigret Sets a Trap' Chief Inspector Maigret is on the trail of a serial killer targeting women in the Montmartre district of Paris. Under pressure to capture the perpetrator, Maigret sets a trap with the help of one of his female colleagues. Will his plan help him finally snare his man? In 'Maigret's Dead Man' the detective receives a worrying call from someone convinced they are being followed. When he later turns up dead Maigret is determined to find the killer, a quest that takes him deep into the Parisian criminal underworld. Meanwhile, the rest of his force is pre-occupied with a series of farm killings. Could the two cases possibly be linked? In 'Night at the Crossroads', Maigret is tasked with investigating the murder of a jewel dealer. When his body is discovered at the home of Dane Carl Anderson (Tom Wlaschiha) he becomes the prime suspect. Despite all the evidence pointing towards his guilt, Carl maintains his innocence, leading Maigret to delve deeper into the mystery. In 'Maigret in Montmartre', a stripper named Arlette (Olivia Vinall) flees to the police after overhearing a plot to assassinate the Countess (Nicola Sloane). When she is found dead just hours later, along with the Countess, Maigret sets out to find the culprit before they can strike again.